So...this is the last post that I'm going to do for a while on kids clothing. Feel free to ask questions at any time though - I am always happy to share what I do and what I've learned. I've been asked a bunch in the last week for tips on how to shop with reselling in mind. The biggest answer to that question comes in learning to not think like a buyer but as a seller. You begin to view clothes as an investment as opposed to a necessary budget line item. Once you think like that, you begin to approach clothing with the idea of reselling. Not all clothes will resell. The ability to resell clothes is directly dependent on brand, condition and even size. It is much easier to sell size 2T and up than it is to sell infant clothes. This is purely based on quantity. When kids reach and pass 2T, clothes get worn for longer which means they get worn out. Infant clothes are in abundance. They get worn for short periods of time or some not even at all. When you go to resale stores, this is why you always see them in abundance. Good condition name brand older sizes are hard to come by so they sell great. So, here's how I personally shop with reselling in mind: I choose to stick to the name brand stores - Gymboree is my most popular, then TCP, Old Navy and Gap. Naartjie is a personal favorite but I don't make it up there often. Then I have a handful of boutique/Nordstroms brands that I watch for - Baby Nay, Baby Lulu, Jenna and Jesse, Lavendar Alley and Little Angel Club. I also watch for Nortstroms blowouts and Nordstroms Rack sales. I have also picked up these same brands at used clothing stores, like Hissyfits, because once they are worn, they will resell for about the same price (a little less). The general rule for pricing your clothes for resale is 30% of the ORIGINAL price, not the price you pay. So when you shop the sale racks, keep this in mind. This holds true for most every brand - the only exceptions I would list are TCP, Old Navy, Target and Carters. The reason being is that they are in abundance. EVERY mom shops there. So when you got to resale or consignment sales, they are the most popular brand. So I price those lower - 20%-25% of the original value. But hands down, Gymboree, Gap and Boutique/Nordstroms brands are absolutely the easiest and quickest to resell and you make the most money back. Another tip for shopping with reselling in mind is to think about what YOU would pay for the item if it were used. If you weren't in the actual store and instead were at a used clothing store, what would you be willing to pay to get the item. Then compare that with the price your are paying for it new to see if it's worth it. If there's a large difference (more than a couple dollars) it's probably not worth the investment unless it's SOOO cute, you just can't leave it behind. ~ Never pay full price. Period. Even if you have a coupon, always match your coupon to sale items. ~ Earn rewards, then spend them**. Gymboree, Naartjie, Justice, Kohls all offer rewards for shopping. They are only earnable during certain windows and only spendable during certain windows. Most will save you 50% (for example, $25 off a $50 purchase) and Kohls earns you 20% off your next purchase ($10 earned for every $50 spent). ~ Couple rewards with sale prices. Sometimes you can even join coupons WITH rewards for additional savings. Gymboree doesn't allow this, but most others do. BEWARE, don't spend more than the reward (see below)! ~ Shop in Outfits. This one might sound crazy to some of you, but yes, I shop in outfits. This is because they resell for MUCH more. Single items you have to price fairly low. If the shopper doesn't have something to match it, they won't buy it unless it's a deal. So, I shop in outfits to resell in outfits and increase profit by at least $3 over single items. ~ Beware of huge advertised sales. Did I just say that? Yep. Here's why - the stores goal to get you in is to advertise "huge sales". But "Huge Sale" doesn't necessarily mean the best prices and usually prices are a little higher than any other day. For example, one would think Black Friday would be huge for savings. Actually, this isn't true. Stores do a handful of "get you in the door deals" and almost everything else is more expensive. You can actually find BETTER savings shopping two weekends prior to Black Friday, than on it or after. **Here is an example of a typical Gymboree experience (with reselling in mind) - I usually repeat this about twice a year depending on needs. ~ In March, I purchased $105.27 in clothes from Gymboree for our trip to Cali. I purchased 14 items total averaging $7.52/item. This was done by buying sale items and using a 30% off coupon. This purchase earned me a $50 gymbuck good off a $100 purchase (50% off). ~ If you average the two trips it comes out to $6.67/item. Most items purchased were either size 4T or girls 5 (so they weren't cheap baby clearance items). When you compare that to stores like Kohls and Target where you average $5/item you can begin to see why I choose to shop at Gymboree. ADD into that the fact that Gymboree resells for $2-$3/item MORE than Target and Kohls then it begins to make complete budget sense. You will actually save MORE money shopping and reselling clothes from Gymboree than from Target or Kohls. So those are my clothing tips. I often get comments on how cute my girls are always dressed and I think to myself, but I don't spend that much on clothes - anyone can do what I do. It takes time, energy, coordination, self-control and shopping more often than most like, but anyone can do it. Yeah!!! You fixed the comments! Good job. 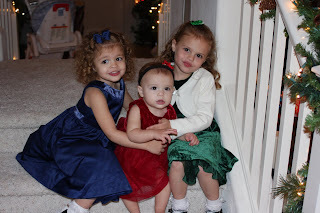 Thanks for sharing all that you have learned clothing your fabulously cute little girls! Can't wait till that little mister enters the mix and shakes things up! It's gonna be awesome! You are so wonderful Abbi!! I am going to STOP thinking Outlets are way better and try to get coupons and just shop at the mall... closer too! I can't wait to start coordinating my girls and since we are done having kiddos well at least girls that is I can start selling the gap/gymboree that I have already :) YAy! Erin - I have heard that boys destroy clothes, you aren't the first mama! The one thing I do know about Gymboree and Gap is that they are made from a higher quality material. They FEEL thicker and sturdier. I've also noticed that stains come out easier. That said, I can't guarantee that your boys won't destroy them. BUT what I try to do with the girls is have some destroyable clothes for them. On days when I know we are going to be out and crazy - at the park, etc., they wear those. No matter what brand you buy, I can pretty much guarantee you that unless you bubble your kids, clothes will get destroyed. I think it's rule 14 in the kids handbook. But they don't have to destroy them ALL. If you click her retail link, she has a list of stores and all the available printable coupons. 3. FaceBook: "Like" all the stores you want to shop at. They announce sales and sometimes offer special coupons. Also, email subscribe (if you aren't already). Some sites give you a coupon/reward for just signing up. It has the markdown days at stores. Also, I watch for when they announce new lines are available in stores. This guarantees that the previous lines have gone on sale! OOOH, also, I DO shop the consignment sales. You can pick up name brand items in good condition, have your kids wear them for a season, then resell the following year for the same price. It's like free clothes! Cyber-Debates - whats your take?